Our case for marriage equality goes to the U.S. Supreme Court. Either way, we are on the path to restoring marriage equality in California. Please support our case for equality with a donation of $5, $25, $100 or more. 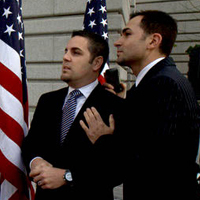 Each and every day that Proposition 8 remains on the books, loving gay and lesbian couples like our plaintiffs, Kris Perry & Sandy Stier and Paul Katami & Jeff Zarrillo, are singled out as “different,” “other,” and “less than,” and their children are forced to endure consequences of state-sanctioned discrimination. Fortunately, this dark mark on California’s Constitution is about to be erased for good. We are so close to finally getting rid of Prop. 8 forever. Your tax-deductible donation today will help our case for marriage equality as it enters its final phase. Over and over, the anti-marriage proponents of Proposition 8 have been turned back in their effort to ensure that gay and lesbian Americans remain second-class citizens. Despite two federal courts ruling conclusively that Prop. 8 is unconstitutional, the anti-marriage forces petitioned for an en banc rehearing by a larger, eleven-judge panel of the Ninth Circuit. Today, that request was denied. Should our case be heard by the United States Supreme Court, I am confident the Justices will stand on the side of fairness and equality. P.S. Be sure to like AFER on Facebook and follow us on Twitter for more updates on timing and next steps.